When you get into an accident with another driver, it can be a frightening experience but you have a good idea as to who is responsible for that accident. It can be only a few options: you, the other driver, or you’re both responsible. But what about a multi-vehicle accident? Proving liability could be difficult and you may be concerned about who will pay your medical bills. How can liability be determined? Before we get into liability issues, first let’s look at the causes of a multi-vehicle accident. How do these crashes occur? It could be for various reasons. For instance, after two cars get into a crash, other drivers on the road may not see them, cannot stop in time, or have no place to go. 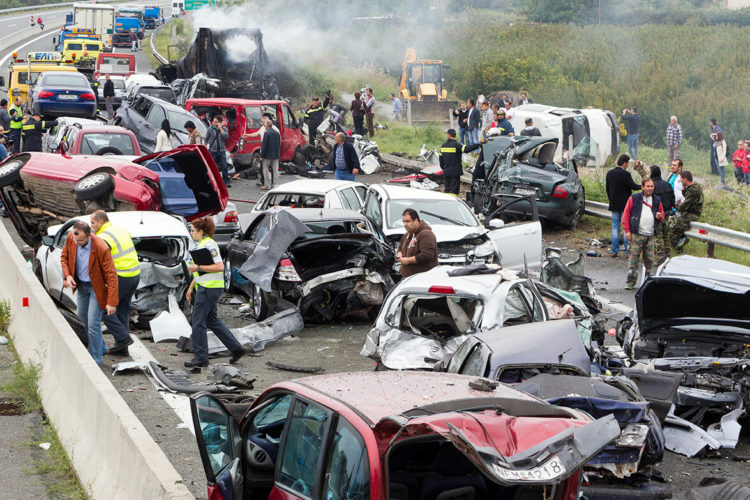 Another way a multi-vehicle crash can occur is a chain reaction, when one car is pushed into oncoming traffic after a collision, such as one car rear ending another, pushing it into the car in front of it and so on. It can be hard to determine who’s responsible for any type of car accident, let alone a multi-vehicle accident. This is why you need an experienced car accident attorney that has the resources available to investigate the accident, find out what really happened, and who are the party or parties responsible for your injuries. If you were involved in a multi-vehicle accident in the Houston, Texas area that caused an injury, you’re going to need the assistance of an experienced personal injury lawyer. For years, the Houston car accident lawyers at de Lachica Law Firm, PLLC, have been helping hundreds of clients with their car accident claims. Contact us today for a free consultation. Fatal Car Accidents Continue to Climb. How Come?